This Salter Brecknell mechanical baby scale is suitable for home or clinic use, perfect for doctors and nurses working in remote locations. This compact and robust design supplies accuracy and reliability at an affordable price. This easy-to-operate suspended baby scale is lightweight and portable. It includes dual markings representing both kilograms and pounds. This simple, easy-to-maintain scale is housed in a tough ABS plastic case with a shatterproof polycarbonate dial cover and corrosion-resistant internal parts. Low friction Acetal bearings provide positive movement to give maximum sensitivity and an accuracy to 1 part in 250. Scale comes with up to 15% zero adjustment. 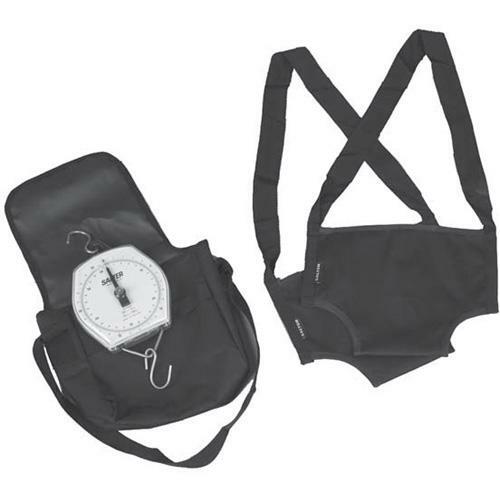 This kit includes the scale, stainless steel hooks, two sets of trouser style slings and a carry bag.